Home > News > Podcast > What Will Business Education Look Like In 2030? What Will Business Education Look Like In 2030? On the latest episode of The Business School Question, we ask Sangeet Chowfla—CEO of the Graduate Management Admission Council—What Will Business Education Look Like In 2030? The Business School Question is brought to you by the team at BusinessBecause. Hosted by BusinessBecause editor, Marco De Novellis, this is a podcast for anyone considering applying to business school. 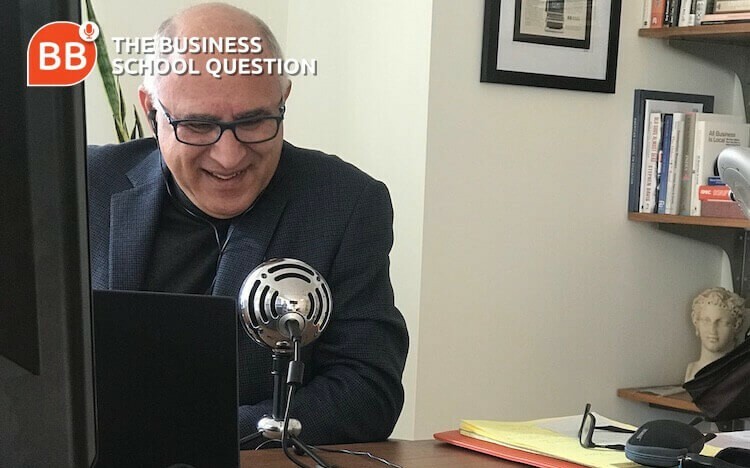 On the latest episode of The Business School Question, we’re asking the question: What Will Business Education Look Like In 2030? To answer it, we’re joined by Sangeet Chowfla, president and CEO of GMAC, the Graduate Management Admission Council—a global association of leading graduate business schools and the owner and administrator of the GMAT (the most widely-used exam for business school admissions in the world). For our next episode, look out for announcements on our Facebook, Twitter, and LinkedIn pages, and on our website. Whether you’re considering an MBA, EMBA, or business master’s program, read more business school news and get practical resources to help your business school application on BusinessBecause. One-Year Vs Two-Year MBA: How Do You Decide? Do Women Work Harder Than Men? Why Should You Study At Business School In China? Why Do Consulting Firms Love MBAs?